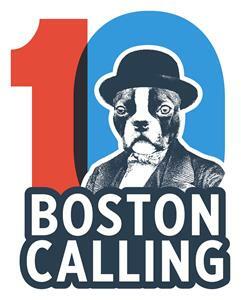 BOSTON, Jan. 22, 2019 (GLOBE NEWSWIRE) -- Boston Calling, celebrating its 10th edition this year, announced its day-to-day lineup today with Single Day tickets going on sale this Thursday, January 24, 2019 at 10:00AM EST. The acclaimed music festival, taking place this Memorial Day Weekend, May 24 – 26, 2019, at the Harvard Athletic Complex in Allston, MA, will deliver more than 55 performances across its four stages. Alt-rock superstars Twenty One Pilots will headline Boston Calling on Friday, May 24; Australian rockers Tame Impala will lead the bill on Saturday, May 25, and hip-hop phenom and recently announced Super Bowl LIII halftime performer Travis Scott will close out Boston Calling on Sunday, May 26. Single Day tickets will go on sale on Thursday, January 24 at 10:00AM EST at www.bostoncalling.com. All performance times will be revealed at a later date. Friday’s music performances at Boston Calling will celebrate classic rock revival, funk, indie pop, and hip-hop with Greta Van Fleet, Janelle Monáe, Christine and The Queens, and Black Star (Yasiin Bey & Talib Kweli). Among the artists performing on Saturday are electronic powerhouse Odesza, hip-hop and R&B sensation Anderson .Paak & The Free Nationals, blues inspired Hozier, King Princess, and the exciting and experimental collaboration between musicians Justin Vernon of Bon Iver and Aaron Dessner of The National – Big Red Machine. Helping to close out the festival on Sunday will be Logic, 2019 multi-Grammy nominee Brandi Carlile, Sheck Wes, Rainbow Kitten Surprise, Marina, and Boston’s own Guster. Boston Calling would not be complete without its comedy and entertainment lineup, featuring several all-star comedians and dancers performing in the festival’s indoor arena. On Friday, Saturday Night Live veteran Fred Armisen and Boston hometown favorite Sam Jay will perform. On Saturday, the arena will host the wildly popular Jenny Slate while Michael Che, current co-host of SNL’s Weekend Update, and fellow SNL cast member Melissa Villaseñor will keep the laughs going on Sunday. Grammy winning singer-songwriter and spoken word star Imogen Heap, along with Boston Ballet, one of the world’s most iconic dance companies, will both perform in the arena on both Saturday and Sunday. Local comedian Lamont Price will take to the mic all three days. 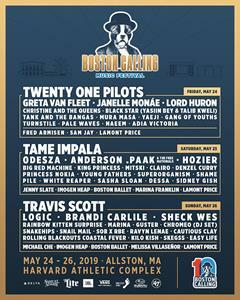 Boston Calling’s 2019 day-to-day lineup is as follows (lineup and artists are subject to change). Performance times are to be announced. Images of 2019 Boston Calling artists and highlight images from the previous nine festivals can be found here. Further details on Boston Calling’s visual art, as well as more information about the festival’s food and drink components, will be shared in the coming months. Boston Calling is proud to have Delta Air Lines, Samuel Adams, Miller Lite, JBL, Barefoot Wine, 47 Brand, and Vans as sponsors for this year’s festival. Tickets: Single Day General Admission, VIP and Platinum VIP Passes go on sale on Thursday, January 24, 2019 at 10:00am EST at www.bostoncalling.com. SINGLE DAY General Admission Passes will be available for a limited time for $99; these tickets offer access to a variety of acts across four stages, admission to daily comedy and entertainment in the arena, access to dozens of food vendors, a wide selection of craft beer and wine offerings, an array of fun outdoor games and attractions, sponsor exhibits, and more surprises to be announced. Announcement Day pricing of $99 per ticket is only available for a limited time. GA payment plans are available for as little as $33 down. SINGLE DAY VIP Passes will be available for $199; these tickets offer a dedicated fast pass entrance to the festival, premium viewing areas at each outdoor stage, access to an onsite VIP staff and an exclusive 20,000 square foot VIP Lounge featuring expanded beverage options including a full bar, comfortable lounge seating, and private air-conditioned restrooms. Announcement Day pricing of $199 per ticket is only available for a limited time. VIP payment plans are available. SINGLE DAY Platinum VIP Passes will be available for $599; these offer all VIP amenities plus access to a platinum viewing experience featuring incredible elevated views of the two main stages, a premium food & beverage package that includes a full specially priced bar featuring beer, wine and craft cocktails; complimentary daily gourmet bites throughout the day and complimentary soft drinks, water and other non-alcoholic options; a complimentary on-site parking pass for each day (one pass per transaction) and access to the exclusive gifting suite, featuring complimentary festival and partner merchandise exclusively available to platinum attendees each day. Announcement Day pricing of $599 per ticket is only available for a limited time. Platinum VIP payment plans are available. A limited number of General Admission Three-Day passes and VIP Three-Day passes are available for $264 and $629, respectively. Additionally, there are a limited number of Platinum VIP Three-Day passes available for $1,129. Payment plans are available in increments of three for both Single Day and Three-Day Passes. Getting There: Boston Calling is best accessed by the T on the Red Line’s Harvard Square stop; from there, it is a short walk to the festival’s main entrance. Boston Calling will also be coordinating with taxi and rideshare programs for safe and easy pickup and drop off points. There will also be bike racks available onsite. Onsite parking is available only to Platinum VIP package purchasers. Boston Calling is produced by Boston Calling Events LLC (BCE) which is owned by Crash Line Productionsand The Madison Square Garden Company. Crash Line Productionsis a Boston-based entertainment production company that owns and produces dozens of events each year. Formed in 2012 by Brian Appel and Mike Snow, Boston Calling Events continues to build its event platform around Boston Calling Music Festival.